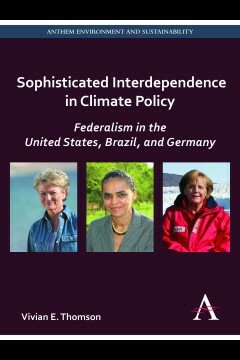 With the US as the world’s most prominent climate change outlaw, “Sophisticated Interdependence in Climate Policy” offers a unique combination of state-level analysis, international comparison and domestic policy prescription, pointing the way to a productive federal–state partnership for climate change policymaking in the United States. Since the Kyoto Protocol’s signing in 1997 the United States has been the world’s most prominent climate change outlaw. In the United States, air pollution policymaking starts and ends with the states, whose governmental units implement federal programs. But we find ourselves in uncharted waters in the United States when it comes to state–federal relations in climate change: many states have developed climate change and renewable energy policies ahead of the national government, and lacking an overarching climate change law, the US Environmental Protection Agency is preparing to employ a little-used part of the Clean Air Act – which revolves around state plans rather than uniform national standards – to regulate greenhouse gas emissions from large stationary sources like power plants. Taking on these challenges, Thomson proposes a framework for climate change policy in the United States called “sophisticated interdependence” that will help foster the coalition-building so desperately needed in the US climate change arena. This framework rests on a nine-state analysis of state-level economic and political forces in the United States and on comparative descriptions of climate change and renewable energy programs in Germany and Brazil, both strong federal democracies and key players in the global climate change policy arena. Vivian E. Thomson is an associate professor in the Departments of Environmental Sciences and Politics at the University of Virginia.